What do the frigid November waters near Greenland have to do with heat-fueled tropical Atlantic hurricanes the following September? A lot more than you might think, at least for Klotzbach’s December forecast. To make a detailed prediction six months before meteorologists even start worrying about hurricanes, Klotzbach relies on a new model that factors in sea temperature and pressure data from the North Atlantic, along with the historical storm record. This fall, the North Atlantic sea surface temperature was significantly above normal, indicating an above-average 2008 hurricane season. Such conditions often lead to warmer sea temperatures and lower sea level pressures that enhance hurricane development in the tropics months later. When analyzing historical observations, Klotzbach looks for parallels between current conditions and those of previous years. For the 2008 forecast, he found five years with similar atmospheric and oceanic conditions. 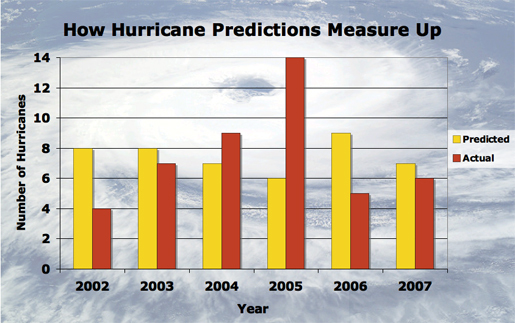 Four of those seasons had between six and eight hurricanes, giving Klotzbach reason to forecast seven in 2008. Klotzbach and Gray are continually looking back at past observations, particularly for the years in which they forecasted inaccurately, to find the best markers for hurricane activity. This year, coming off poor 2006 and 2007 forecasts, Klotzbach used the new set of indicators, including the North Atlantic temperature and pressure readings. Klotzbach said he has “somewhat more confidence” in this new model because it was successful when applied to past hurricane seasons. Klotzbach will tweak his December forecast with updated predictions in April, May and August. In these later forecasts, he can analyze environmental conditions a lot closer to the equator where most hurricanes form. “By the time we issue our final seasonal hurricane forecast in early August, our predictors are all in the tropics or sub-tropics,” he said. These predictors lead to changes for the later forecasts, but December’s report is still a powerful tool: in four of the last five years, the number of hurricanes predicted in December was within two of August’s adjusted figure. * You can follow the forecasting method in detail by reading the December forecast for the 2008 season.